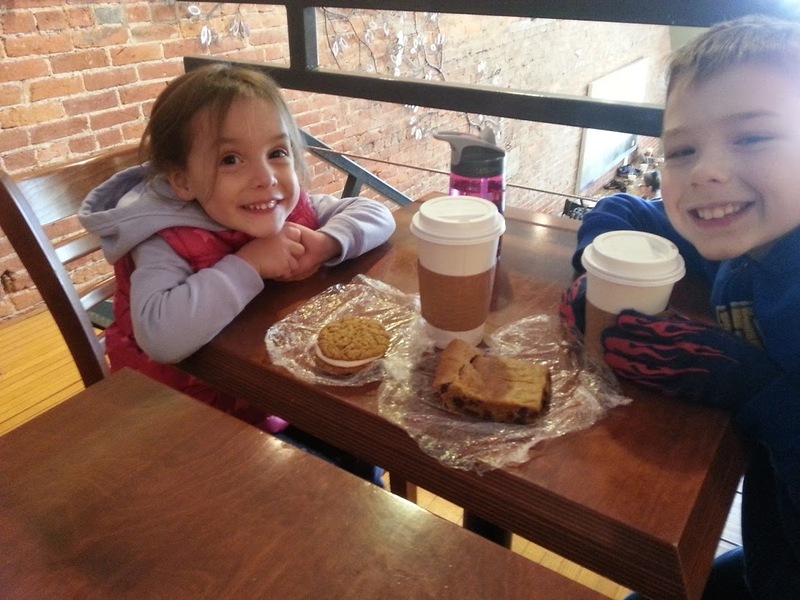 Coffeeneuring isn’t just for grown-ups, as 5-year-old finisher Sally proved last year. 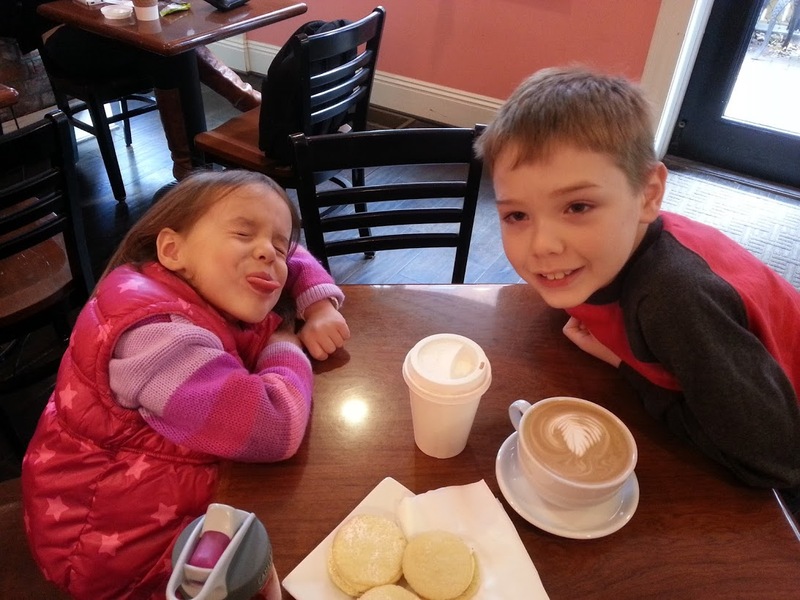 Coffeeneuring can be for kids, too. It can even be fun for the family. 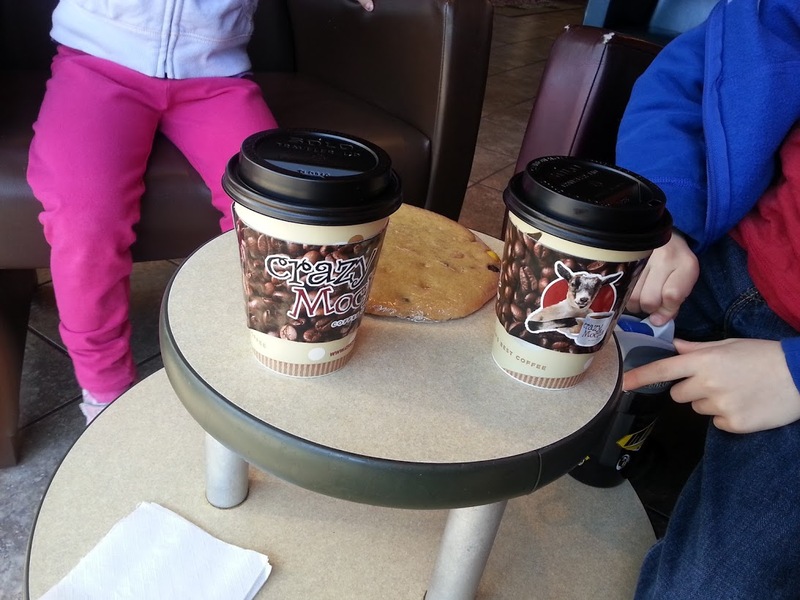 Plus, who can resist the great photo ops Family Coffeeneuring provides?! 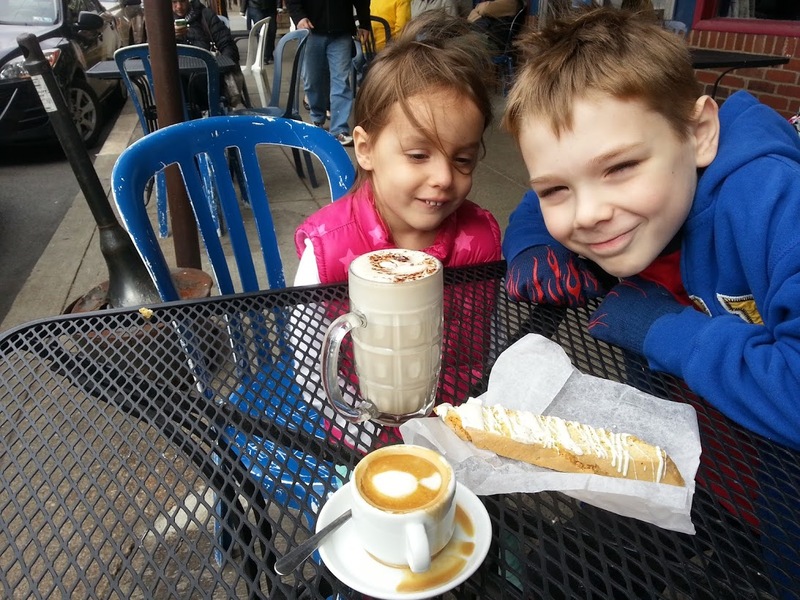 Many thanks to Dan, Owen, and Elaine for representing the Family Coffeeneuring contingent, as well as the fine city of Pittsburgh, in the previous edition of the Coffeeneuring Challenge. Please enjoy their guest post. 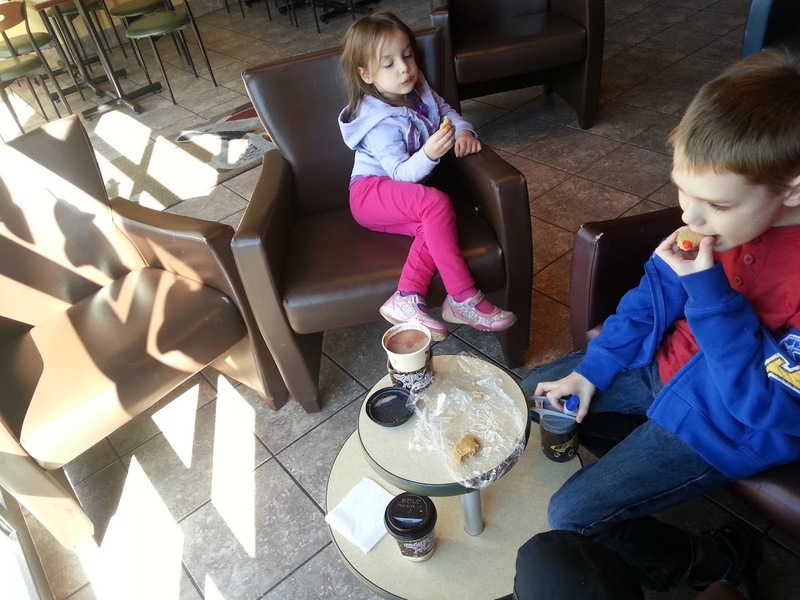 Family coffeeneuring is a great deal of fun. Sure, the mileage is a bit less (okay, an order of magnitude less), but it’s a great excuse to get the kids out even when the weather is less-than-perfect. Eight trips for myself, seven for my eight-year-old Owen, and six for 4-year-old Elaine, for two successful completions and one near-miss. Riding the Fuji tandem turned into a spur-of-the-moment coffeeneuring trip, with a stop at Marty’s Market in the Strip District. 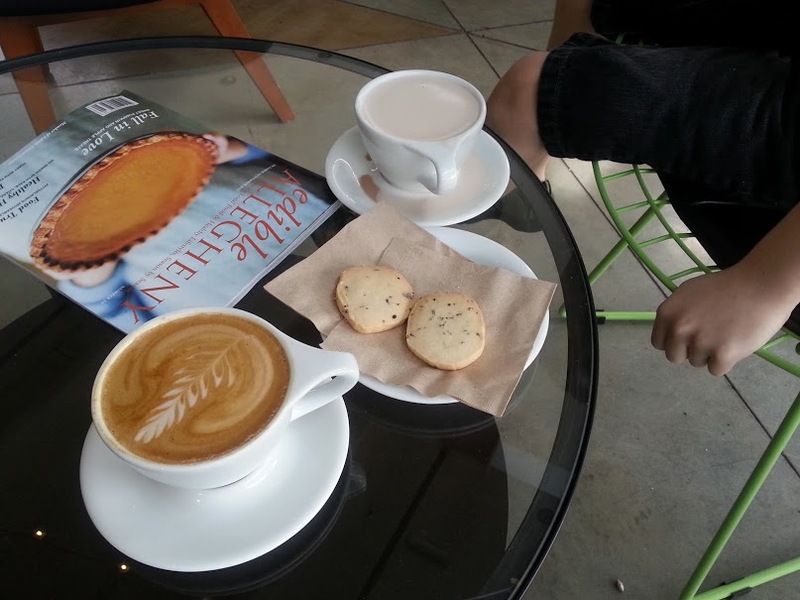 Mocha for me, cocoa for Coffeeneuring Cadet Owen, and some yummy lavender shortbread cookies to be shared. 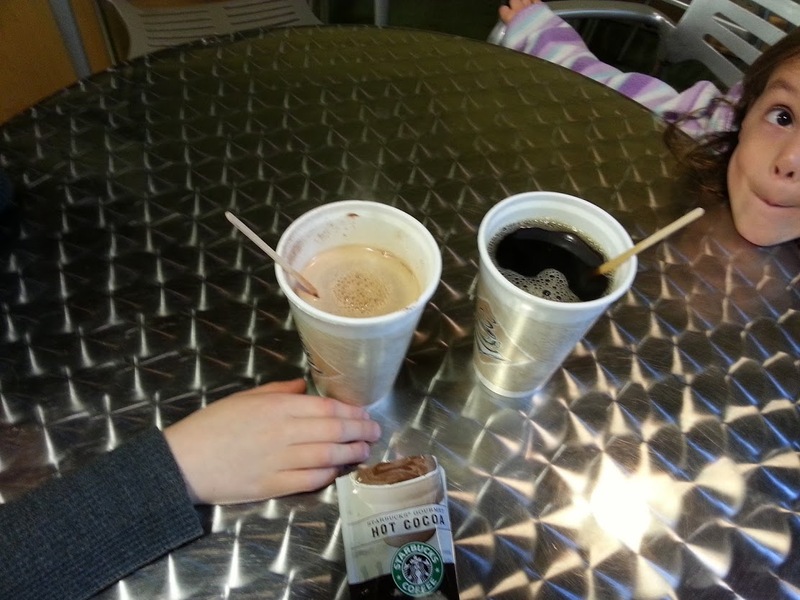 Tanzanian Peabody drip for me, cocoa for the kiddos to share, and a Cookie As Big As My Face for all three of us. A lovely ride. Started at the Swinburne St trailhead, then over Hot Metal to the Crazy Mocha. A jaunt down the trail a bit, then back to see if the new riverside segment below Hofbrauhaus was yet open (it wasn’t). Lunch at Qdoba, then back across the river to the car and home. Ride highlight: Elaine discovered that she could stand up to put some more oomph into the pedals on the tough climbs…few things cuter than a 4-year-old dancing up the hill out of the saddle on a pink be-streamered bike. More brisk than the previous day’s ride, but still pleasant. The kids and I initially headed for Klavon’s, but found them closed for undisclosed reasons. Undaunted, we made our way to 21st St and La Prima Espresso to salvage our coffeeneuring plans, then to the river and followed the trail most of the way to the Point. This was also notable as the first day that either kid did any real street riding when not somehow attached to me; the Strip on a Sunday is so low-traffic as to be ideal for novice road riding. Another Oakland->Hot Metal->Southside trail ride, with various and sundry digressions. Hot chocolate for the kids, mocha for myself, and some form of lemony vanilla home-made stuffed cookies which, if there were any justice in the world, would put the Oreo brand out of business in one fell swoop. 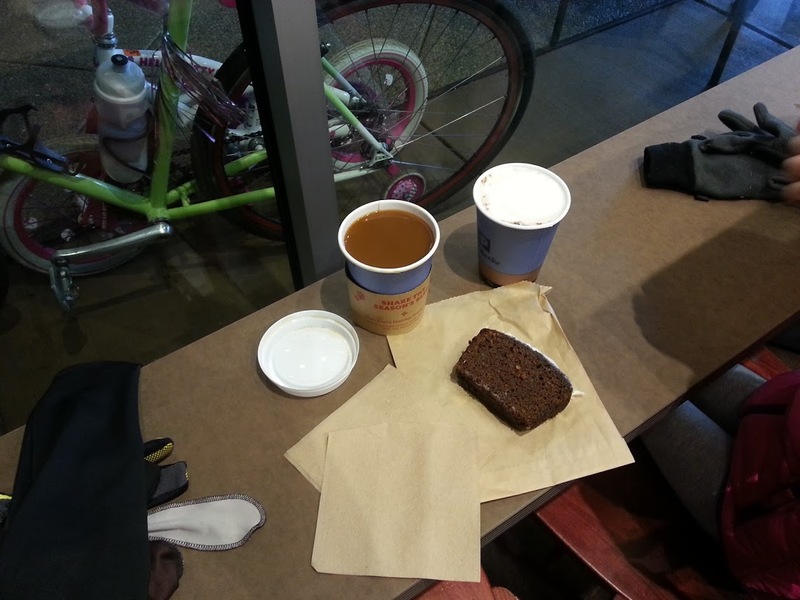 Owen was a bit under the weather, so Elaine and I went coffeeneuring without him. We delayed our departure until late morning, as the skies were a bit ominous; then over to Elaine’s favorite starting point at the Swinburne St trailhead. While no rain manifested, the headwinds were significant; steady 15-20 mph, with gusts up to 30s. This was Elaine’s first experience with headwinds…she held up well, but was a little dismayed when she stopped pedaling and found herself rolling backwards. I encouraged her to get behind me, and had her “draft” me until we crossed the river and got out of the full force of the wind. We encountered friends srpit and Vannevar on the Hot Metal Bridge; they, while already done with their formal coffeeneuring, were on their way to Big Dog, site of our coffeeneuring trip last weekend. Per recommendation from @Vannevar and @srpit, we parked in Millvale and rode down the Three Rivers Heritage Trail to the Heinz Lofts, former manufactory site of world-renowned Heinz 57 Varieties Ketchup. Unfortunately, they were out of/didn’t carry any hot chocolate; fortunately for the kids’ coffeeneuring ambitions, I had an emergency package of Starbucks cocoa in my bike bag. We enjoyed our beverages, shared a pizza for lunch, then headed back up the trail. Given the rain, Elaine was not terribly interested in going for a bike ride (demonstrating once more that, even at the age of four, the female of the species possesses significantly more common sense than the male) so Owen and I girded our collective loins and ventured off into the steady rain. No specific destination…we merely hopped on the tandem and started cruising some of the less-traveled roads in our area, looking for a sheltered spot to set up coffee camp. After a minimal amount of aimless wandering, we found a shelter at nearby Gillot Field in Bellevue, just across the valley from our house. This was our inaugural use of the Jetboil stove I just picked up at REI; I was quite pleased with how rapidly it boiled our water, less pleased with how poorly the spark igniter worked. All in all, though, it could have been far worse. Thanks for the inspiration, Dan, Owen, and Elaine! 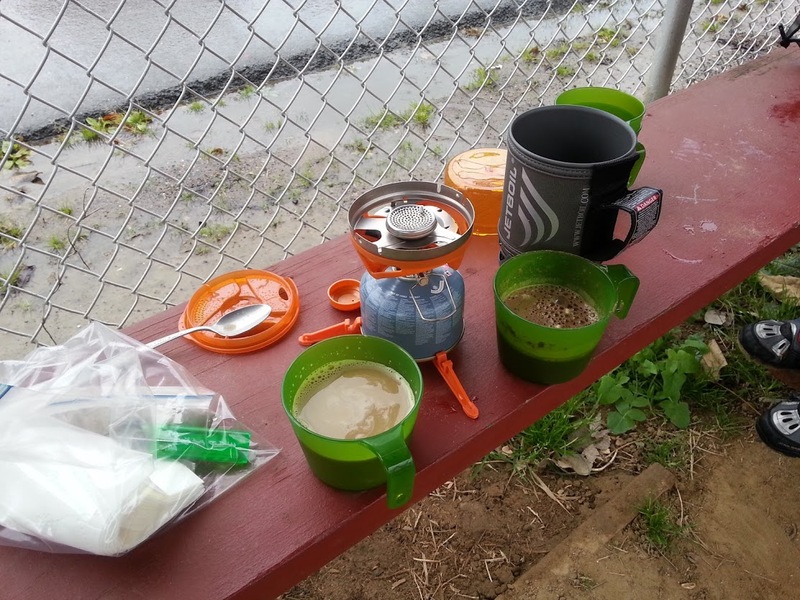 Remember, the Coffeeneuring Challenge kicks off again on October 4. Even though coffee is my usual hot beverage of choice, a couple of those cocoa’s looked mighty tasty. I might just have to log in a trip to the chocolate capitol of the world as one of my destinations to toast Elaine’s pedal dancing prowess and Owen’s indoctrination….uh, introduction…to the joys of all-weather riding. Great job to you both!